We have finalised a number of details for the upcoming State Champs! PRESENTATIONS: Our annual AGM and State Champs presentations will be held at Anderson Hill winery, within walking distance of the start/finish and Fox Creek trails carpark. PLEASE BE AWARE THAT we will not be beginning the presentations until the site is packed up, so we are asking for all hands on deck. Anderson Hill have kindly donated $10 gift vouchers for all AMBC State Champs entrants and volunteers, and are putting on an express menu with chips and burgers in addition to their winery menu. Please show your support and get behind this wonderful family owned business! Committee positions will be open at the AGM and we are still looking for a race director – so please get on board! 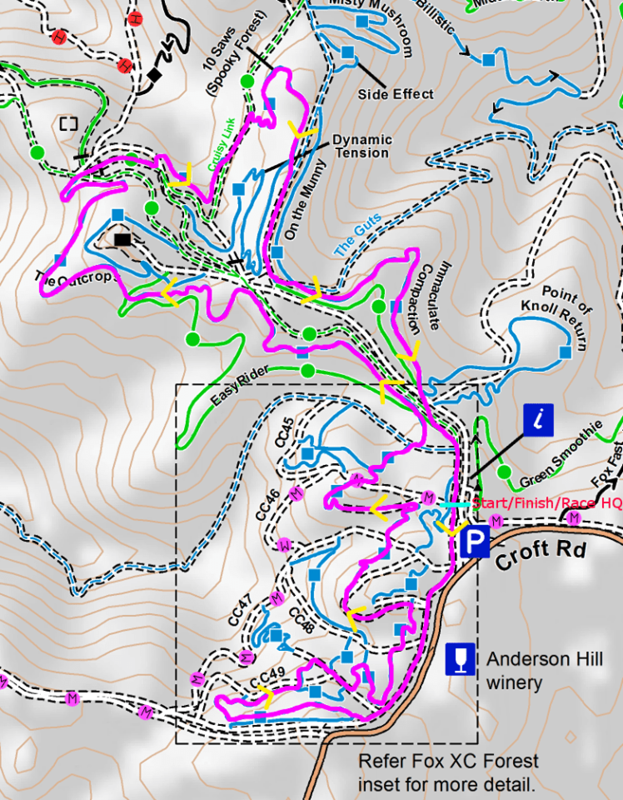 COURSE: The course will use the same trails as last year, however is subject to slight adjustments based on trail conditions, see map below. GPX data will be released shortly. Lap counts are subject to further testing however an indicative lap count can be found http://ambc.asn.au/event-info/state-championship-race/. Suitable for all high school students, and primary years 6-7. Brought to you by AMBC and our major sponsors Hammer Nutrition, Schwalbe Tyres, Mitre 10 Barrow and Bench, and BD Farm Paris Creek. For this race AMBC reverts to Mountain Bike Australia age classification categories. Age categories are calculated based on age on 31st December. Lap numbers will be assigned to categories at a later date, and is subject to change where necessary. To assist with this we will be issuing ALL competitors with a fresh, race specific plate. If you are currently in possession of a race plate, please bring it along as we will also be conducting a plate muster. The race is being held at Fox Creek, adjacent to the Croft Rd triangle. 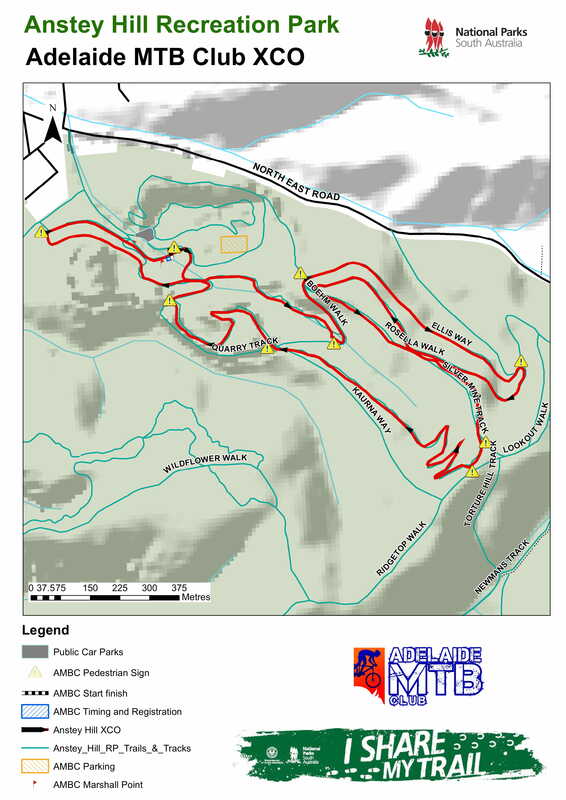 The course will utilise Fox Creek’s XC trail network, including the pine forest, outcrops and Thomas Hill loops. A course map will be posted at a later date. Parking will be directed on race day. Entrants will be notified prior to the event. ** Suggested laps per grade based on a 15 minute Elite lap time. This is a guide only and the number of laps is variable due to different venues and different track conditions. +$25 for an MtBA day license. If you have any questions, feel free to email committee2018@ambc.asn.au for more information! Anstey XCO- Entry closes 3pm today! For those new to Anstey Hill, entry to the park will be from Gate 1 just off of North East road. The start/finish will be a short drive into the park, as shown on the official map below. Please be mindful of upholding a respectful image of MtB’ers and be friendly to other park users. See you tomorrow! All of the details for the upcoming race at Anstey Hill. New venue time! Our first ever XCO race at Anstey Hill on the 26th August is set to be an exciting one. Perhaps it’s your first time heading to these new(er) trails or you are a local looking for your first XCO race experience. Either way, it is the perfect opportunity to get out there and try something new! Self seeded, ability based categories for XC racing. Parking will be directed on race day. Entrants will be notified prior to the event. Entry will be from Gate 1 on North East Road, from the North Western corner of the park. Please be mindful that Anstey Hill RP is a popular park for walkers, wildlife enthusiasts and dog owners. Be respectful to the park and it’s users and represent MTB’ers sensibly! ** Suggested laps per grade based on a 15 minute Elite (A Grade) lap time. This is a guide only and the number of laps is variable due to different venues and different track conditions.